I don't really believe in "miracle" products - there isn't anything out there that is going to fix all of your skin problems. 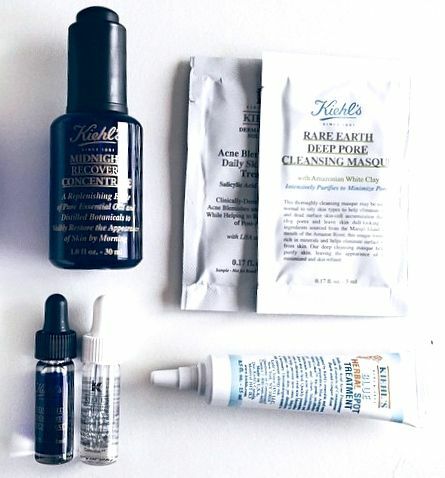 But I would say that Kiehl's Midnight Recovery Concentrate comes pretty darn close. I don't have a ton of major skin concerns, just the pretty typical one - hormonal acne, redness on my cheeks, uneven skin tone, and blackheads on my nose. I'm 27 now, so a few wrinkles show up here and there too. My skin is on the dry side, and it's been especially bad this winter. I've been using the Midnight Recovery Concentrate for about a year now, and I just re-purchased a second bottle. It's an oil that you use at night to repair your skin overnight. The way I use it is that I remove my makeup (I use coconut oil), then use the Say Yes to Tomatoes face wash, and then dry my face. I put about 5 drops of the concentrate in my hand, and smooth it on my skin, focusing around my drier areas and my eyes. That's all I do in the summer, but with the winter weather I wait about 30 seconds and then moisturize with my favorite Say Yes To Cucumbers moisturizer. The only difference between these pictures is 7 hours. I took these in a windowless bathroom, so the lighting didn't change. As you can see, my skin tone is evened out, my skin looks smoother, and pores look a little smaller. My face doesn't feel tight or itchy like it does when it's really dried out, which for me is one of the most important things. Some of you asked on instagram if I really actually like this product, and I can say with 100% honesty that I really do. I bought the 1 ounce bottle in March of 2014, and it lasted me 9 months with nightly use. While almost $50 is a lot up front, it ends up costing about 17 cents per use - 17 cents I find very very worth it. is it okay to wear black and brown together?